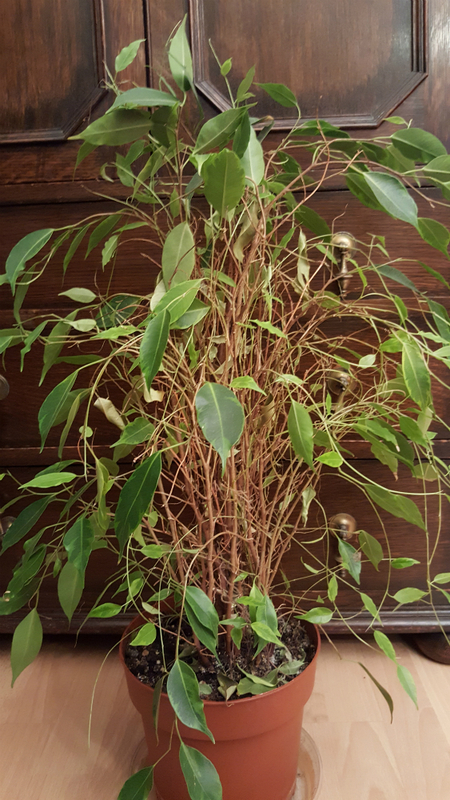 I have got a ficus, presumably Ficus benjamina variegata. It is not in the best shape, presumably because it was a bit overwatered. What confuses me is that it drops leaves (a bad sign) and at the same time it grows new branches (presumably a good sign). Should I just let it happen? Or should I chop off the new branches to encourage it to grow leaves on the existing branches? I am (now) aware of the general ficus caring advice: no draughts, no changes in room temperature, no moving around, and daylight but no direct sunlight, water when the surface of the potting medium feels just about dry to the touch, then watered well, but not left sitting in water in any outer tray or pot after 30 minutes - thanks to How can I revive these house plants. Browse other questions tagged houseplants leaves ficus branches or ask your own question. How to prevent my Ficus plant from growing new branches low? Why is my Ficus losing its leaves? Are there seed pods growing on my Ficus benjamina? Ficus elastica — Will its leaves uncurl?